On the way up a week ago we could see across the canyon to some skinny trails perched on steep slopes. Today we are going to be hiking on those trails. 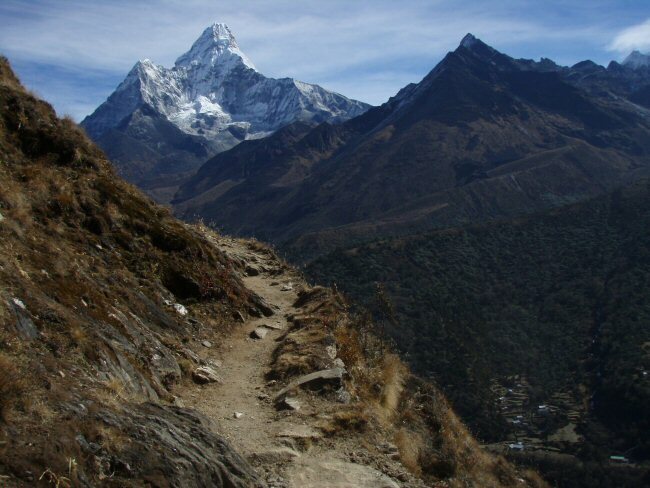 According to David, these are a little more like Nepal trekking twenty years ago: narrow trails, less traffic, few villages or guest houses. The trail itself is a real treat: cut into steep cliffs, it is always going steeply up or down as it finds its way round steep rock ribs and deeply incised side canyons. It is much longer than it looks from across, or even on the map, because it is going in and out, up and down all the time. I would enjoy this a lot more if I were not still suffering going uphill. I just decide that I will go at my own pace, and let everyone go on ahead. But today, of all days, we are asked to stay together, or at least in sight of each other, due to the steepness of the cliffs. So the main pack gets ahead, stops and waits, but takes off as soon as the slower of us catches up. No rest for the people at the end. More frustrating than being the slowest is the fact that I have lost my voice: I cannot speak. It does not hurt, but it is really annoying that every time I try to say something it either comes out as a croak or as a whisper. It is fun to spot and identify the villages on the opposite canyon wall where we stopped. There is Deboche, where it snowed, Pangboche, with the old monastery, and Tingboche, with the big monastery. 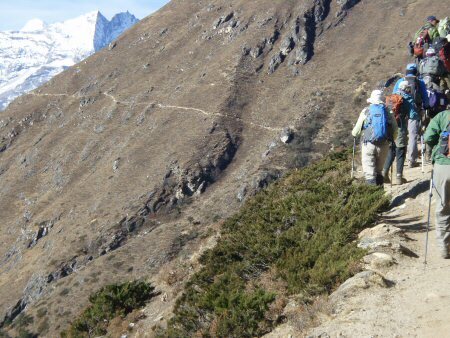 I see where I climbed the ridge high above Tingboche, when I still had energy to spare. 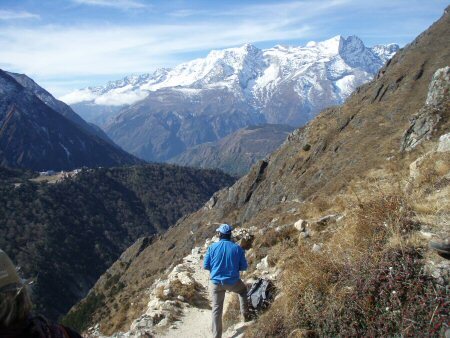 As we proceed down, we finally come to Phortse. I am ready to stop and rest, but we are close to the campsite, so I force myself onward. There is not much in Phortse except farms -- no public accommodation that I can see. This is the "old" Nepal. It turns out we are staying at Phortse Tenga, a full 700 feet lower than Phortse itself. The trail drops very steeply down. I don't want to think about the fact that we will have to make up all this lost altitude tomorrow. It seems a little warmer, and my appetite is returning a little bit. My energy remains low and my voice barely a croak, but I can see that things are getting better.